For the human players to win the game, they must successfully jump the fleet enough times to reach Kobol. Once the fleet has reached Kobol, the humans immediately win the game. 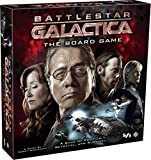 For information on the Cylon players' objective, see Cylon Objective. 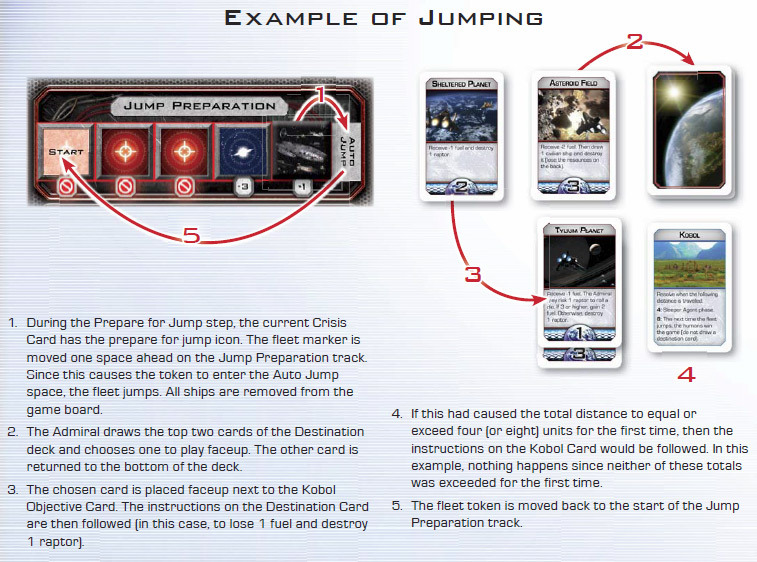 The fleet token is moved to the "Auto Jump" space of the Jump Preparation track. A player activates the "FTL Control" location. If the fleet jumps this way, then some population may be lost. Remove Ships: Remove all ships from the game board. Choose Destination: The Admiral draws two cards from the Destination deck, chooses one, and places the other on the bottom of the deck. Follow Instructions: The Admiral places the chosen card faceup next to the Kobol Objective Card and follows any instructions on the Destination Card. Kobol Instructions: If the previous step causes the total distance on Destination Cards placed adjacent to the Kobol Objective Card to equal or exceed four or eight for the first time, then follow the instructions on the Kobol Objective Card. Reset Jump Preparation Track: Move the fleet token to the start space of the Jump Preparation track. Character sheets, Skill Cards, Loyalty Cards, and Quorum Cards can all provide abilities to players. Many abilities are prefaced with the word "Action" followed by a colon, which means that the character may only use it as his action during his Action step. All other abilities do not require an action, and are used when specified. If multiple players wish to use an ability at the same time, the current player decides the order. Example: An unmanned viper has just been attacked by a raider and an "8" is rolled. Starbuck plays an "Evasive Maneuvers" piloting card, which allows her to reroll the die. If the fleet marker has moved to one of the blue spaces of the Jump Preparation track, players may force the fleet to jump using the "FTL Control" location. If the fleet jumps due to someone activating this location, there is a chance that the fleet will lose some population. The current player rolls the die, and if a "6" or lower is rolled, then a number of population is lost equal to the number listed on the current space of the Jump Preparation track. Players then follow all steps for "Jumping the Fleet" on this page. Example: The fleet token is on the second-to-last space of the Jump Preparation track (the -1 population space). The current player activates the "FTL Control" location to jump the fleet. He rolls a die, and it is a "5" (which is "6" or less), so the fleet loses 1 population. Each Destination Card has two important pieces of information on it. In the center of the card are the special effects of traveling to this destination. These effects usually include losing fuel or other resources and/or following special instructions. The effects of a Destination Card are immediately followed when the fleet travels to that destination. The bottom of each Destination Card lists a distance number. 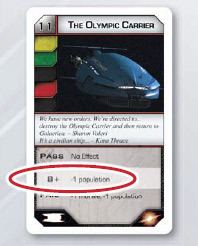 After the special effects of the card are followed, it is placed faceup next to the Kobol Objective Card, so that the total distance the fleet has traveled can easily be seen. 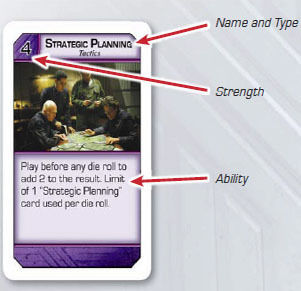 The Kobol Objective Card lists important information, including when additional Loyalty Cards are dealt out and how the human players can win the game. When the fleet equals or exceeds a listed distance total for the first time, the players perform the following instructions. 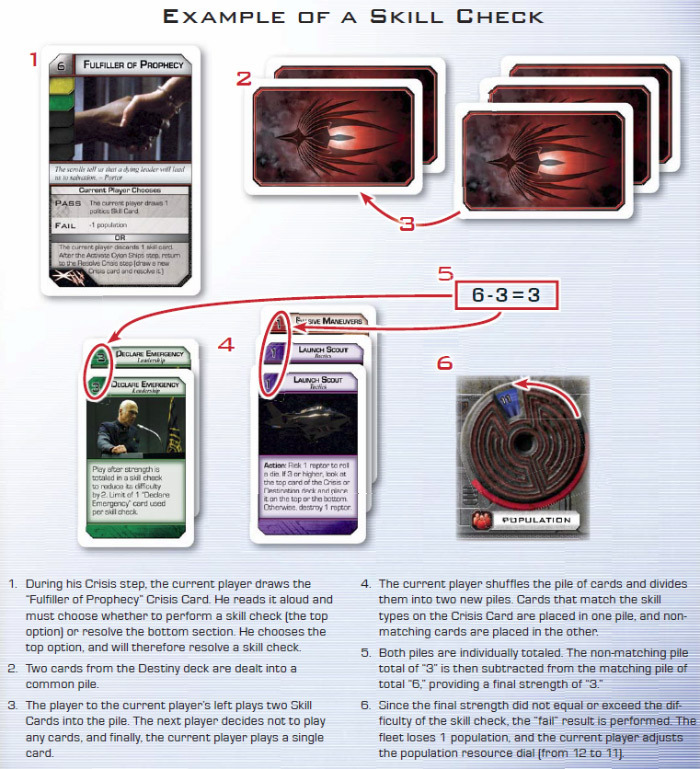 These instructions are also summarized on the Kobol Objective Card. Sleeper Agents: When four or more units of distance have been traveled, the remaining Loyalty Cards are dealt out. Reach Kobol: After eight or more units of distance have been traveled, the humans are only one jump away from winning the game. The next time the humans jump, they do not draw a Destination Card; instead, they simply win the game (as long as every resource is higher than 0). Example: The human players have 1 population resource remaining and have traveled 8 units of distance. 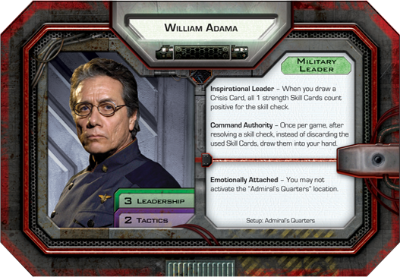 William Adama uses the "FTL Control" location to jump the fleet. The humans will win the game due to this jump, as long as they do not lose any population due to the "FTL Control" location. Politics: This skill represents a character's ability to control morale and help the fleet overcome crises. This is the most common skill type required by Crisis Cards. Some politics cards also provide the ability to allow a player draw Skill Cards from outside his skill set. Leadership: This skill represents a character's ability to take charge of situations and command other individuals. This is the second-most common skill type required by Crisis Cards. Some leadership cards allow players to move other characters and grant them a bonus action. Tactics: This skill type represents a character's ability to plan missions as well as to physically overcome obstacles. Tactics cards allow players to gain bonuses to die rolls as well as scout the galaxy for new destinations. Piloting: This skill represents a character's ability to fly vipers. Piloting cards allow players to reroll enemy attack rolls as well as gain additional attacks. Engineering: This skill represents a character's strength in the mechanical and scientific fields. Some engineering cards allow players to repair vipers and locations aboard Galactica. If a player has more than 10 Skill Cards in his hand at the end of any player's turn, he must discard cards (of his choice) until he has only 10. This hand limit does not include other cards, such as Quorum Cards or Super Crisis Cards that may be in a player's hand. Whenever a player discards a Skill Card, it is placed in a discard pile faceup next to the appropriate Skill deck. When a deck runs out of Skill Cards, the discard pile is shuffled to create a new Skill deck. At the start of the game, a deck of 10 Skill Cards (two of each type) is created and shuffled. Two random cards from this deck are placed into each skill check, and add an element of uncertainty. After the last card from the Destiny deck is played, the current player creates a new one by dealing out two cards of each skill type. He then shuffles those cards thoroughly and places them on the appropriate space on the game board. Read Card: The current player reads the entire card (or location) out loud to all players. Players may then discuss what they would like to do (following the guidelines under "Secrecy Rules"). If the card requires the current player, the President, or the Admiral to make a choice, he must make the decision at this time. Any choice that does not have a pass/fail effect requires players to carry out specific instructions instead of a making a skill check. Play from Destiny Deck: Two cards from the Destiny deck are dealt facedown together, starting a common pile. 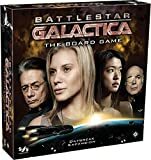 This pile can be placed on the Battlestar Galactica logo of the game board, or any common area that is in reach of all players. Play Skills: Starting with the player that is to the left of the current player (and ending with the current player), each player may play any number of Skill Cards from his hand facedown to the common pile. Any text on the Skill Cards played onto the pile in this manner is ignored. Only the strength and types of skills on each Skill Card is relevant when played into a skill check. Shuffle and Divide Cards: After each player has had one opportunity to play Skill Cards, the current player takes all Skill Cards from the pile and shuffles them. (The cards are shuffled so none of the players will know which players contributed which cards to the pile). He then deals them faceup into two new piles. All cards that match a skill type (color) listed on the Crisis Card are placed in one pile, and all other cards (i.e., those that do not match) are placed in the other pile. Total Strength: The total strength (upper left number) of each card pile is totaled. The total strength of the nonmatching pile is subtracted from the total strength of the matching pile, giving a final strength. Determine Result: If the final strength is equal to or greater than the skill check's difficulty, then the "pass" result of the skill check is carried out. Otherwise, the "fail" result is followed. All Skill Cards contributed toward the skill check are then discarded into the appropriate discard piles. Although it is technically the current player's responsibility to make sure that Skill Cards are discarded properly, many play groups prefer to assign one player the role of SKILL SUPERVISOR at the start of the game. This player is in charge of sorting discarded Skill Cards into the appropriate discard piles. In addition, when a Skill deck runs out, this player is responsible for reshuffling the appropriate discard pile to form a new deck. Lastly, when the Destiny deck runs out, this player is in charge of creating a new Destiny deck (by collecting two of each Skill Card type and then shuffling them together). Some skill checks have a partial pass number listed between the "pass" and "fail" results. If the skill check is not passed, but this partial pass number is equaled or exceeded, then this result is followed (instead of the "pass" or "fail" results). Administration: The current player chooses any player to nominate for the presidency. A 5 difficulty politics/leadership skill check is resolved with the following results. - Pass: The nominated player claims the President title. Admiral's Quarters: The current player chooses any character to accuse. A 7 difficulty leadership/tactics skill check is resolved with the following results. - Pass: The accused character is moved to the "Brig". Brig: The current player attempts to escape the "Brig" location. A 7 difficulty politics/tactics skill check is resolved with the following results. - Pass: The current player may move his character to any space on Galactica.